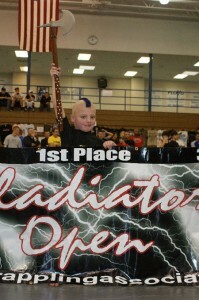 On January 30, 2010, Kobe Cochran, one of the youngest Revgear fighters, competed at Gladiator Open in Rome, Georgia. He won first place in kids 49.9 lb division, advanced No Gi and Gi. Kobe submitted his opponent with a triangle choke to win in No Gi division, and he submitted his opponent with a rear naked choke to win in Gi division. Kobe also moved up in weight to 89.9 and under intermediate Gi and got second place.